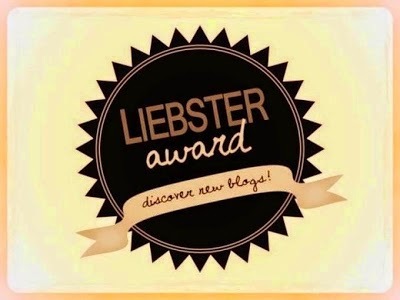 My blog posting as been very sparse in 2013 to date. 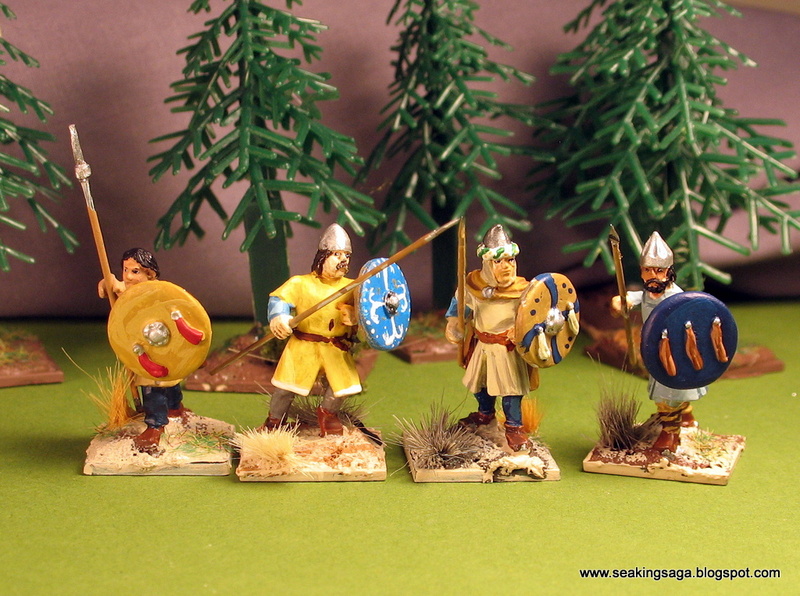 Hopefully, that should change in the coming weeks, as I have been furiously painting Spanish, Andalusian, Berber and Sudanese armies for a series of posts and write ups in the coming weeks. Forced into the mountainous north by the Umayyad invasion in 711 AD, the Christian nobility clung to the kingdom of Asturia. In the ninth and tenth centuries, the Christian kingdoms restrengthened and gradually expanded south. On the Spanish plains the Asturian kings needed to develop a strong cavalry force, capable of defending the frontier and operating with some degree of self sufficiency. To encourage settlement on the frontier, small landowners were granted commissions of land in exchange for military service. This was not a feudal relationship per se, the small farmers were not of high enough status to become royal vassals and there was no ritual performed on either party's behalf. Rather, it was a contractual relation. Into the eleventh century, settlement became more numerous and organized. Towns were created by royal charters, called fueros, and land was granted on the basis of cavalry service (caballerias) and infantry service (peonias). Caballero Hidalgos or later just Hidalgos - greater and lesser knights who did have a feudal relationship with the king or a count (comes in Spain). Caballero Villanos - most important class in the towns of central Spain. Along with a small number of hidalgos, they formed a urban military aristocracy that gave Spanish towns of the eleventh and twelfth centuries a different character than Italy, with its merchant elite. They functioned as light horsemen and the jinete, referring more to a style than a type of soldier, involved fast moving and maneuvering cavalry equipped with javelins. Above, a group of hidalgo villanos. Though not as well armored as knights, their horses, shields and clothing indicate wealthier status. Below, several groups of foot soldiers. 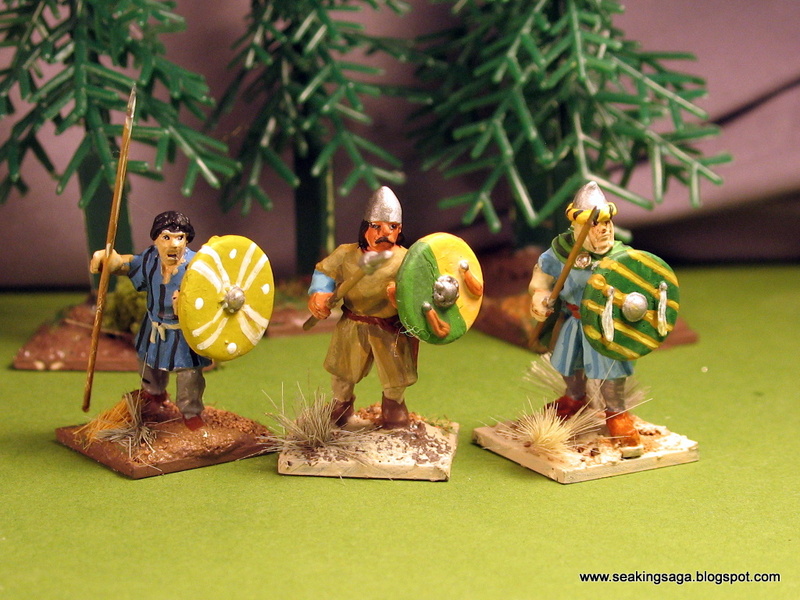 Figures are from Crusader Miniatures. 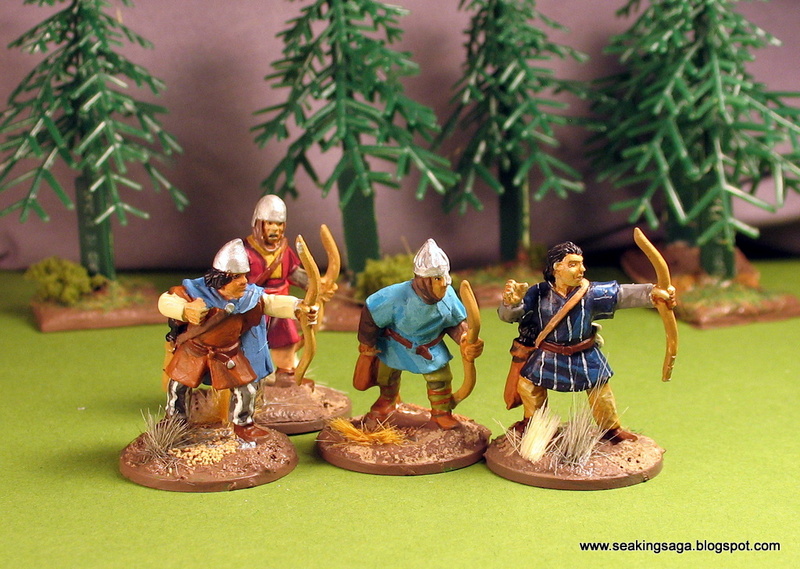 Below, a group of fairly well equipped spearmen, perhaps some urban militia. 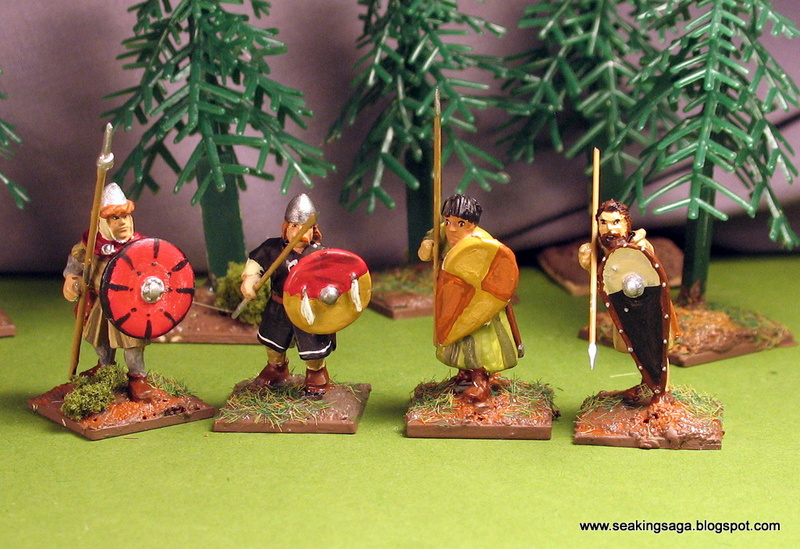 The two on the right are from Gripping Beast. Peones -small landowners and tenants not able to afford a horse and the requisite equipment gave their service as a peones, or foot soldier. Better equipped and trained foot soldiers bore a shield, spear and sword. 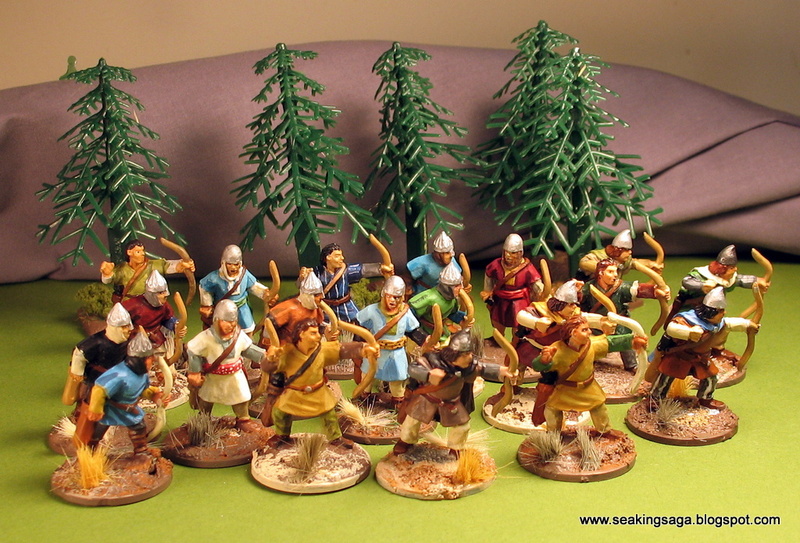 Skirmishers, drawn from the shepherds or Basque hill people, were proficient with bow, sling or javelin. Duties of the Spanish soldiers were to guard the towns and frontier, especially the herds of livestock. Far from just defenders, Caballeros and Peones were expected to go on the offensive and raid enemy territory, be it Muslim or Christian. Raiding was also an opportunity for advancement, with soldiers at all levels enriching themselves through plunder and ransom. Military service was essential to the reconquest of the Iberian penninsula, but Spanish kings were well aware that overly burdensome terms of service would not attract the necessary populations to the frontiers. Age exemptions only applied to those over 70 years, which speaks to relative health of older people in pre-modern times. As always, one could purchase their way out of service, and the fee was twice as much for a caballero as a peony. Family situations were also considered, with the newly married or those caring for sick relatives capable of receiving temporary exemptions. There are several good options for wargaming the early Reconquista period. 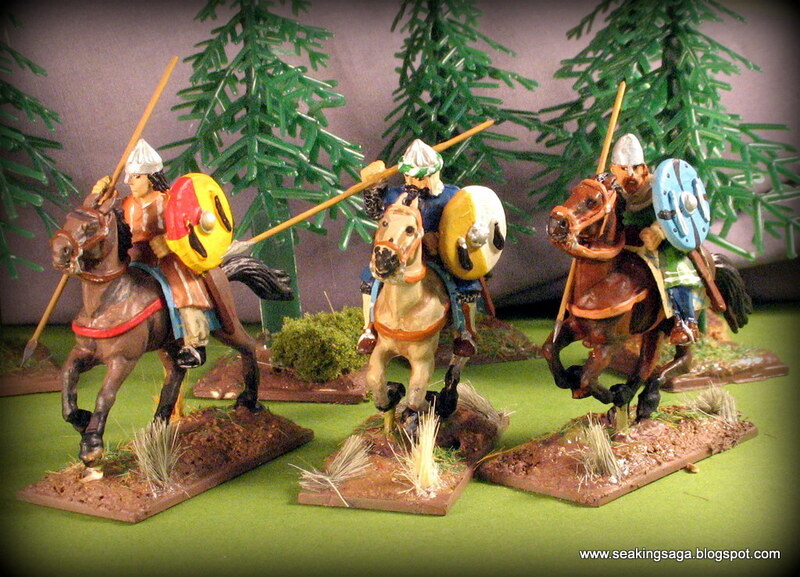 I do not own a copy of the Warhammer Ancient Battles El Cid supplement, but it was quite popular. Reconquista army lists for Field of Glory were found in both the Wolves from the Sea and Oath of Fealty supplements. My current preferred large battle historical system game is Clash of Empires, and my eventual goal is to build a 2500 to 3000 point Spanish army. SAGA is my other favorite game currently. While a Spanish supplement is highly likely in the next year or two, adapting a current battleboard is the best option. The three classes of men, Hidalgos, Caballero Villanos and Peones fit into SAGA's divisions, and the best analog is probably the Norman or Breton battleboard. Lourie, Elena. "A Society Organized for War," Past and Present, No. 36, December 1966, pp. 54-66. Powers, James . "Frontier Military Service and Exemption in Municipalities of Aragon and Castile, vol. 45. Military Affairs.